There are nine way-marked walking trails in the valley of Glendalough. The walks vary from a short half hour stroll to a long four hour hillwalk. Large maps of the walks are displayed outside the National Park Information Office and at the OPW Visitor Centre beside the Monastic City. All the walks start and finish at the National Park Information Office near the Upper Lake. Each trail is signposted with colour-coded arrows. Staff at the Information Office can help you choose a suitable route. A map of the Walking Trails is on sale at the National Park Information Office at the Upper Lake and from the Visitor Centre at the Monastic City. We are currently upgrading the boardwalk along the Spinc. On certain days, when a helicopter is dropping off materials, the route will be closed between the Miners’ Village, to the Glenealo bridge, and up to the junction between the Red and White routes. On these days, the Red and White routes will be affected. The Miners’ Road (purple route) and the Blue route (Spinc shortcut) shall still be accessible. Unfortunately, due to weather considerations, we are unlikely to know the dates too far in advance. Please ring the National Park Headquarters (0404 45800) for more details. A leaflet containing both the map and descriptions given here can be purchased in the National Park Information Office or the Glendalough Visitor Centre. 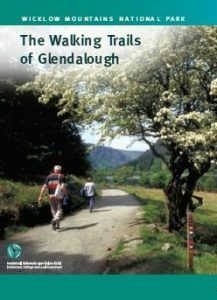 The map of the Walking Trails of Glendalough is available to download here. Please Note: The original leaflet is A3 in size. If you print out the map on A4 paper, the text will be very small. This walk skirts one side of the Upper Lake. The trail passes through Scots pine woodland before reaching the ruined Miners’ Village. Halfway along the trail, the cave known as St. Kevin’s Bed can be seen across the lake. Feral goats are common on this walk. Peregrine Falcons may on occasion be seen high in the sky soaring and calling to each other with a high-pitched cry. Walkers on the Miners’ Road Walk may also want to download a Nature Trails leaflet to accompany this walk. Both the Bird Walk and the Mammal Walk follow this route. This trail rises steeply alongside the Poulanass Waterfall, leading you through the Glendalough oak woodlands. It then winds gently down to the site of St. Kevin’s Cell. At this point there is a scenic viewpoint overlooking the Upper Lake, which is a good place to birdwatch. A visit to Reefert Church is worthwhile before ending your walk. The Green Road is an easy stroll on mostly flat ground. This walk passes through the Glendalough oak woodlands before dropping down onto the Lower Lake wetland edge. Views up the valley from the boardwalk here are spectacular. Lizards and dragonflies are often seen sunning themselves on the wooden trackway. The wetlands are a valuable breeding place for frogs. Walkers on the Green Road Walk may also want to download a Nature Trails leaflet to accompany this walk. The Flower Walk follows this route. This trail climbs steeply up alongside the Poulanass Waterfall before leading you to the upper reaches of Derrybawn Mountain. Flanked by larch and pine trees, the route offers magnificent views of the whole Glendalough Valley. Red squirrels and birds such as treecreepers are often seen here. In early summer, wood sorrel, bluebells and wood anemones add colour to the woodland floor. This trail begins with a short but steep climb up by the Poulanass Waterfall and plunge pools. (The name Poulanass is taken from the Irish ‘Poll an Eas’ which means ‘hole of the waterfall’). The trail crosses above the waterfall to drop down through mixed woodlands to the valley floor. Listen out for woodland birds, in particular jays, which can be quite noisy. This is a pleasant walk through one of the more secretive areas of Glendalough. It weaves through mixed woodlands into neighbouring Glendasan Valley. The trail follows the Glendasan River back towards Glendalough, where it then joins up with the boardwalk which runs through the Lower Lake wetlands. This popular walk leads you through some of the most spectacular scenery in Co. Wicklow. (The name Spinc comes from the Irish ‘An Spinc’ and means ‘pointed hill’). The trail ascends steeply up by the Poulanass Waterfall before joining a boardwalk. More than 600 wooden steps lead you to a viewing point overlooking the Upper Lake. The boardwalk skirts the top of the cliffs before descending through blanket bog and heath into the picturesque Glenealo Valley, home to a large herd of deer. A rough track then leads you back down into Glendalough Valley. This walk follows the same route as the other Spinc trails up onto the boardwalk. It stays on this boardwalk for 1.7km before turning off in the direction of Lugduff Mountain. This Section of the trail is a good place to spot deer and birds such as Raven, Merlin and Kestrel. Finally the trail links up with the Wicklow Way track to lead you back to the Information Office. Although this walk is short in comparison to the other Spinc routes, it still leads you into mountainous terrain where navigational experience is necessary. The walk follows the Poulanass Waterfall before entering the Lugduff Valley. From there, a steep climb up steps brings you onto the boardwalk which hugs the cliff of the Spinc, before cutting down through forest to lead back towards the Information Office.